Everyone has been doing so well over the last two weeks, I have been hearing from many of you that you are feeling GREAT! Keep posting those comments to the blog and sending in the emails. It's only going to get better! For those of you that are feeling that the results aren't coming fast enough remember it has only been TWO weeks. We are trying to build something and it a work in progress. Each habit is building upon the last and if you stick with it, the results will come. It is really setting us all up to succeed! 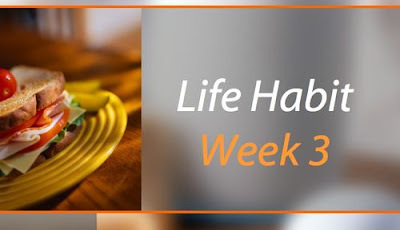 Let's get started with week 3 - you are going to make each meal (remember you are eating five to six meals a day) and each of those meals is going to be a combination of PROTEIN + CARBOHYDRATES. How much of each? We are going to address fat intake in future weeks. A little bit of fat is okay - but we want HEALTHY fat. Not fried food, butter, etc. For right now try to make really good decision on your fat intake, we will be diving into FAT soon! So why are we going eat this way? Carbohydrates are digested slower when combined with protein. The slower, the better. Protein is needed to burn fat and feed muscle. We need carbohydrates for many functions, including fat burning. However, too many carbohydrates at ONE sitting (one meal) causes the fat storage process. Carbohydrates are designed to give us energy. If we eat more at one sitting that what we actually need for energy, our bodies store it for later. Body fat is 'stored up energy' that didn't get used. We need to start feeding our lean muscle and this is the way to do it. Right now I can tell that I need to cut my carbohydrates WAY down. I am exercising five days a week - three of those days are with my trainer and I am still what I consider soft. I want the sculpt and toned look so combining more protein and less carbohydrates will help me get there. I have exactly four weeks until MAUI! TIP: Peanut butter is not a protein - there is protein in it, but it is not a full source of protein. 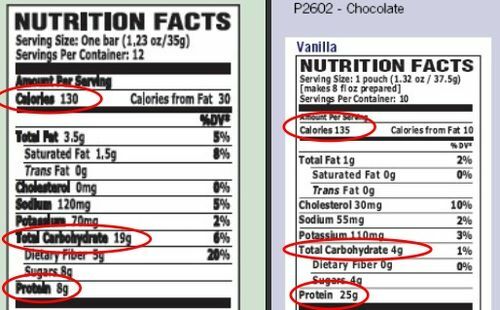 Look on the label and see how much fat is in it compared to how much protein...be careful and be sure to read your labels! What foods contain larger amounts of protein? What foods contain larger amounts of carbohydrates? Spark is mainly a carbohydrate, but don't drink this with a meal. It is best on an empty stomach first thing in the morning. If you do this don't count it towards your carbohydrate count, if you do take it with a meal then you need to count it as your carbohydrate. All bars, meal replacement shakes and post-workout recovery shakes are carbohydrate/protein combined. The recovery shake being on the higher end of a carbohydrate. How do you determine the serving sizes? Look at your hand and the diameter and the thickness of your palm is about 15 to 20 grams. Remember that you have an allotment of 30 grams of carbohydrates to eat per meal - that doesn't mean you have to eat 30 grams, just up to 30 grams is your limit. It's the opposite for the protein, you have to have at least 10 grams. You want to shoot for more than that. Hopefully that makes sense - if not let me know! What I plan on starting this week is continue with my Meal Replacement shake first thing in the morning. I want to preface that you don't need to use what I use - but you want something that has a one to one ratio of carbs & protein. The shake I drink has 24 grams of carbohydrates and 24 grams of protein - great way to start off the morning. Then for the additional meals I am going to be relying on the Muscle Gain powder since I don't get enough protein until the last meal of the day (dinner). Finding the carbohydrates is obviously not hard for me - watching the portion control is. The palm of my hand is going to be a good measuring tool! 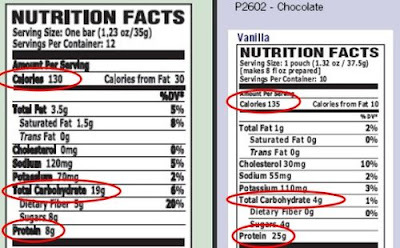 Here is a good example of reading labels and how I am going to supplement the protein. On the left hand side is a fiber bar, as you can see good on the carbs but VERY low on the protein. The right hand side is Muscle Gain protein powder (with water). When I combine the two (fiber bar and muscle gain) I will have the right amount of carbs, protein and calories. 265 calories (under the 300), 23 grams of carbohydrates and 33 grams of protein. When in doubt, eat a bar or have a shake - have them at your desk, purse, etc. For Mexican food, fajitas with corn tortillas are your best option. For example one corn tortilla + 1/2 cup of beans = carb limit. This would mean skipping the chips! Group input needed! 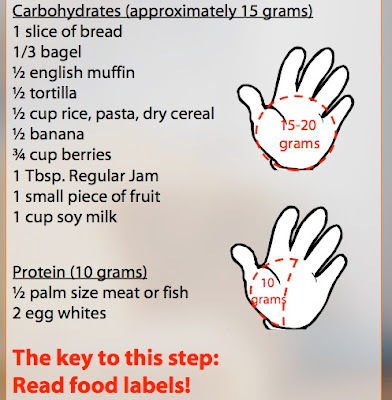 Grab five to 10 carbohydrate food items you have within reach. Determine the serving size a person can eat and still consume 30 grams of carbohydrates or less. Post your finds to the blog! 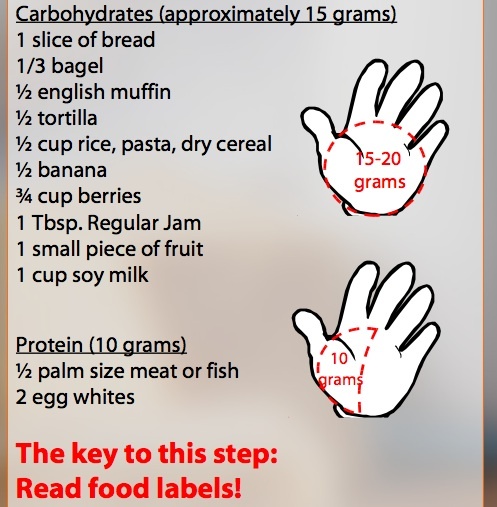 HINT: Read the 'serving size' at the top of the label and then read the grams of Total Carbohydrate. How are you going to get your daily points? Don't forget that you are still earning points by having 12 glasses of water per day and five mini meals - now you just need to modify those mini meals. There are 3 possible points a day. If you have any questions or concerns be sure to email. Here's to another great week and Enjoy life!